Knee Braces - Orthotics & Prosthetics Labs, Inc.
Knee braces are devices used to treat numerous different types of injuries and diagnoses. The type of brace is determined based on your diagnosis and physician's orders. Custom and off the shelf knee braces are determined by our licensed practitioners. Knee braces are designed to help treat your specific condition while maintaining daily function and providing optimal support. Some of the companies that we use are Breg, Donjoy, Corflex, Townsend and Bledsoe. We are contracted with most insurance companies and most braces are covered in part or in full based on your prescription from your providing doctor. 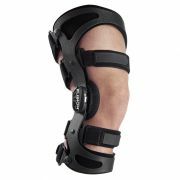 Functional knee braces help provide stability of the knee joint and are great for anybody that has had any type of ligament sprain/tear or even a surgical procedure for repair or reconstruction. Injury to ligaments or meniscus cause unwanted knee motion and require stabilization from these braces. There are multiple types and styles of functional KO’s, we also provide OTS and Custom knee braces for certain activities such as sports or any daily activities. 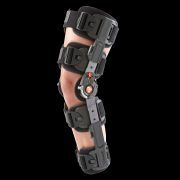 Unloader knee braces are similar to functional knee braces except they have an adjusting dial to offload or unload either medial or lateral compartment osteoarthritis and to help reduce bone on bone rubbing with pain, inflammation and help provide support during daily activity. Again we have multiple options to find the right orthosis for you or your patient. 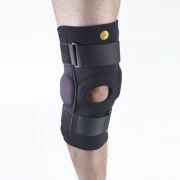 Range of motion knee braces are braces that have specialty hinges with certain degrees to allow proper range of motion. These braces are used primarily for post-operative/surgical recovery use or people with contractures or hyperextension issues. 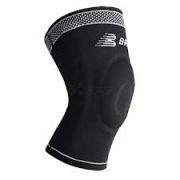 Regular hinged knee braces are mostly made from non-latex neoprene material that are either pull on or wrap around Velcro styles with metal hinges built in to the brace for stabilizing knee sprains/mild arthritis and minor injuries. These knee braces provide support and medial/lateral stability while helping aid in daily support. 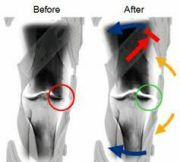 Patella stabilizing braces are hinged knee braces that have extra patella padding to help provide medial/lateral support and provide better patellar knee tracking. Knee sleeve braces are made from an elastic/neoprene material and some have elastic stays for more moderate support needed in cases such as an acute sprain or mild injury. These braces also provide more of a compression support and help with pain management.